The aluminum road stud reflector is a traffic safety device to provide light for drivers at night and in bad weather conditions to prevent serious accidents which are caused by vague traffic lines. The aluminum road stud reflector is produced by mould, and it does not need to assemble, which improves it pressure resistance and load capability greatly. The battery, electronic component and LED lights are sealed inside the road stud with special technique. The road stud is waterproof, and it can be used on ponding roads or places where are wet. 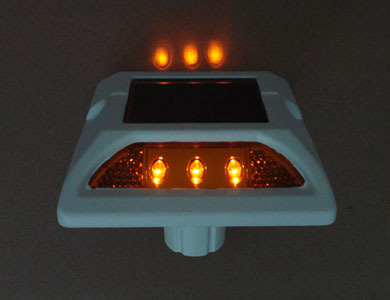 The LED lights are mounted in one side or double sides of the road stud according to be customers’ requirement. The handgrips or screw holes are set on both sides of the reflector which can make it being fixed firmly on the ground. The aluminum solar road marker is an environmentally friendly road facility which can delineate the road clearly from up to 800 meters away. Aluminum Solar road marker increases the visibility of intersections during low-visibility conditions and helps improve the road users’ recognition of intersection location and features. It has strong impact resistance and abrasion resistance. It is easy to install, and only the standard epoxy adhesives will be OK. 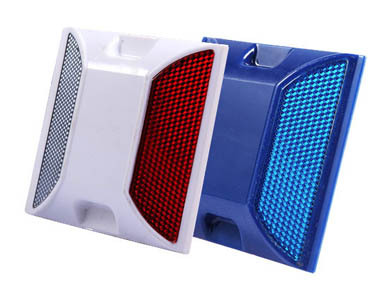 The aluminum road stud reflector is one of the hot sale products of NOKIN TRAFFIC FACILITY, and it receives a large number of praises for it fashionable outlook and high-quality. The products of NOKIN all pass the tests of the Ministry of Transport. It combines research and development, design, producing and installation together, and it is always working on provide high-quality products to clients all over the world. NOKIN is willing to establish long-term cooperation relationship with you!